Raising happy healthy animals and producing healthy food are important to us. We use NO growth hormones and do not use antibiotics except in rare cases of life threatening illness. All of our beef products are free of nitrates and nitrites. Our animals are handled gently and are raised outside with ample space to roam and graze in the fresh air and sunshine. We aim to be good stewards of the land and provide the most nutritious feed for our animals. 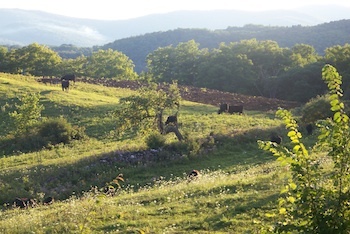 For these reasons, our cattle are mostly grass-fed. Our cattle and poultry are moved frequently to fresh pastures of sweet grasses and clover throughout the grazing season. This allows the grass to regrow and avoids overgrazing. Our brood cows calve during the months of March and April. We monitor the cows very closely during calving season so that we can assist them if there is any difficulty. 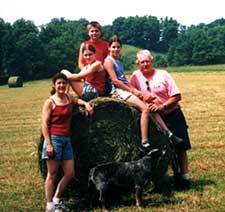 In the winter, our cattle eat high quality hay harvested here and at neighboring farms. We make all of the hay that our cattle consume without the use of chemical fertilizers. Our nutrient management plan allows us to monitor our soil fertility and guides us in applying composted manure, lime, and wood ash to the fields. All grains that we feed are non-GMO.